Uncle Brad, Aunt Nae and Allee gave Jenna a cute tote FILLED with all kinds of activities and crafts which Jenna loved. 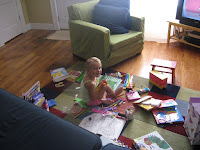 This was what the family room looked like at 6:30 Sunday morning...she couldn't wait any longer to dig in and see what was in the tote. 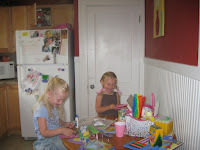 Tuesday her friend Jaiden from down the street came to play "crafts" with her. They made an absolute mess but had a ball doing it for almost 2 hours! Yesterday, Jenna also got to have Allee at her house all day. We were babysitting while aunt Nae went to a class for the day. 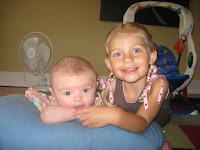 Allee was full of smiles and Jenna loved being by her, I'm not sure Allee would say the same since most of the time it meant she was being smothered. This is Jenna being a stinker over the weekend. She was running through the Elmo sprinkler with Dave when she decided it would be funny to hold it and spray him with it!